It started a decade ago with Pantone, the color matching giant, announcing a go to color for the upcoming year. Since then, major paint manufacturers have presented their own choice for color of the year. So, with 2018 just around the corner, announcements are being made for the year’s up and coming colors. 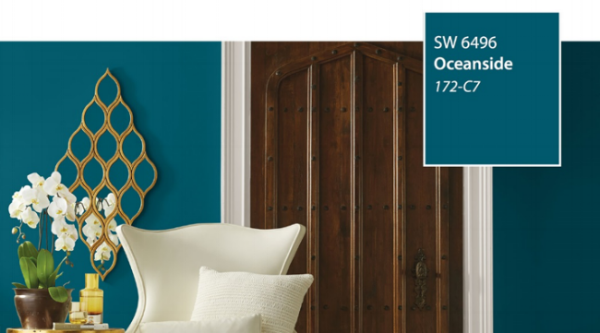 Sherwin Williams recently announced “Oceanside” (SW 6496) as their choice for the color of 2018. “A collision of rich blue and jewel-toned green, Oceanside is universal when it comes to design style from mid-century modern to Mediterranean-inspired, traditional to contemporary”, according to Sue Wadden, director of color marketing at Sherwin Williams. NewStudio was ahead of the curve on this one. 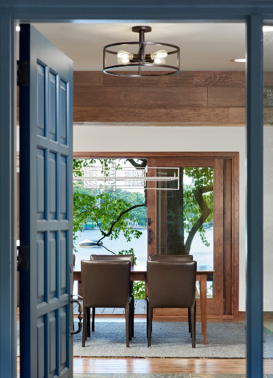 Interior designer, Coco Dugan Early, specified a deep blue green for the front door of a Deephaven residence remodel. Inspired by the tones found in Lake Minnetonka, the color ties the house’s nautical theme to the deep tones of lake on which it sits. Photo Credit: Benjamin Moore Look for Caliente to make an appearance in an upcoming NewStudio project! PPG brand paints revealed “Black Flame” (1043-7) as their 2018 color of the year. “Black Flame acts like a black curtain, allowing your other design elements to take center stage. It’s a fantastic blend of black and navy, tow classic hues”, according to PPG’s press release. We are anxiously awaiting Pantone’s reveal of COTY 2018!